This article is about the economics concept. For other uses, see good (disambiguation). In economics, goods are materials that satisfy human wants and provide utility, for example, to a consumer making a purchase of a satisfying product. A common distinction is made between goods that are tangible property, and services, which are non-physical. A good may be a consumable item that is useful to people but scarce in relation to its demand, so that human effort is required to obtain it. In contrast, free goods, such as air, are naturally in abundant supply and need no conscious effort to obtain them. Personal goods are things such as televisions, living room furniture, wallets, cellular telephones, almost anything owned or used on a daily basis that is not food related. Commercial goods are construed as any tangible product that is manufactured and then made available for supply to be used in an industry of commerce. Commercial goods could be tractors, commercial vehicles, mobile structures, airplanes and even roofing materials. 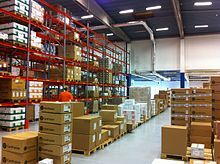 Commercial and personal goods as categories are very broad and cover almost everything a person sees from the time they wake up in their home, on their commute to work to their arrival at the workplace. Commodities may be used as a synonym for economic goods but often refer to marketable raw materials and primary products. Although in economic theory all goods are considered tangible, in reality certain classes of goods, such as information, only take intangible forms. For example, among other goods an apple is a tangible object, while news belongs to an intangible class of goods and can be perceived only by means of an instrument such as print or television. Goods may increase or decrease their utility directly or indirectly and may be described as having marginal utility. Some things are useful, but not scarce enough to have monetary value, such as the Earth's atmosphere, these are referred to as 'free goods'. In normal parlance, "goods" is always a plural word, but economists have long termed a single item of goods "a good". Ugly though this may sound, an alternative is hard to find. In economics, a bad is the opposite of a good. Ultimately, whether an object is a good or a bad depends on each individual consumer and therefore, it is important to realize[according to whom?] that not all goods are good all the time and not all goods are goods to all people. Types of goods in economics. 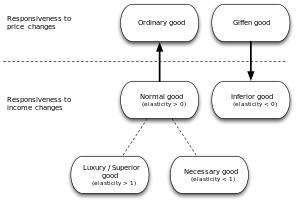 Goods' diversity allows for their classification into different categories based on distinctive characteristics, such as tangibility and (ordinal) relative elasticity. A tangible good like an apple differs from an intangible good like information due to the impossibility of a person to physically hold the latter, whereas the former occupies physical space. Intangible goods differ from services in that final (intangible) goods are transferable and can be traded, whereas a service cannot. Price elasticity also differentiates types of goods. An elastic good is one for which there is a relatively large change in quantity due to a relatively small change in price, and therefore is likely to be part of a family of substitute goods; for example, as pen prices rise, consumers might buy more pencils instead. An inelastic good is one for which there are few or no substitutes, such as tickets to major sporting events, original works by famous artists, and prescription medicine such as insulin. Complementary goods are generally more inelastic than goods in a family of substitutes. For example, if a rise in the price of beef results in a decrease in the quantity of beef demanded, it is likely that the quantity of hamburger buns demanded will also drop, despite no change in buns' prices. This is because hamburger buns and beef (in Western culture) are complementary goods. It is important to note that goods considered complements or substitutes are relative associations and should not be understood in a vacuum. The degree to which a good is a substitute or a complement depends on its relationship to other goods, rather than an intrinsic characteristic, and can be measured as cross elasticity of demand by employing statistical techniques such as covariance and correlation. The following chart illustrates the classification of goods according to their exclusivity and competitiveness. Goods are capable of being physically delivered to a consumer. Goods that are economic intangibles can only be stored, delivered, and consumed by means of media. Goods, both tangibles and intangibles, may involve the transfer of product ownership to the consumer. Services do not normally involve transfer of ownership of the service itself, but may involve transfer of ownership of goods developed or marketed by a service provider in the course of the service. For example, sale of storage related goods, which could consist of storage sheds, storage containers, storage buildings as tangibles or storage supplies such as boxes, bubble wrap, tape, bags and the like which are consumables, or distributing electricity among consumers is a service provided by an electric utility company. This service can only be experienced through the consumption of electrical energy, which is available in a variety of voltages and, in this case, is the economic goods produced by the electric utility company . While the service (namely, distribution of electrical energy) is a process that remains in its entirety in the ownership of the electric service provider, the goods (namely, electric energy) is the object of ownership transfer. The consumer becomes electric energy owner by purchase and may use it for any lawful purposes just like any other goods. ^ Quotation from Murray Milgate,  2008, "goods and commodities, " The New Palgrave Dictionary of Economics, 2nd ed., preview link Archived 2013-05-27 at the Wayback Machine, in referencing an influential parallel definition of 'goods' by Alfred Marshall, 1891. Principles of Economics, 2nd ed., Macmillan. Bannock, Graham et al. (1997). Dictionary of Economics, Penguin Books. Milgate, Murray (1987), "goods and commodities," The New Palgrave: A Dictionary of Economics, v. 2, pp. 546–48. Includes historical and contemporary uses of the terms in economics. This page was last edited on 23 February 2019, at 08:43 (UTC).